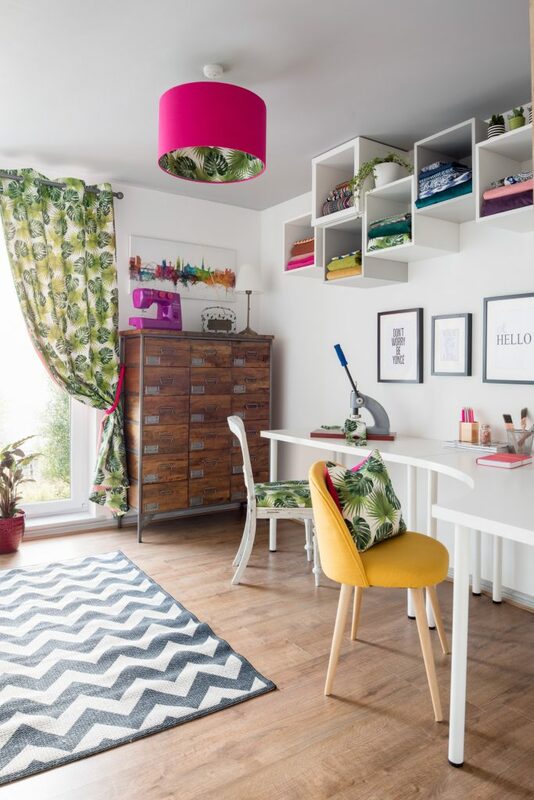 The brief was to create a practical and fun home office/craft room that needed to have multiple functions. The space was relatively small so we needed to make the most of storage and desk space. The room needed to work as both a craft/sewing room and as a home office, so there needed to be room for working at a computer, cutting fabric and sewing simultaneously. 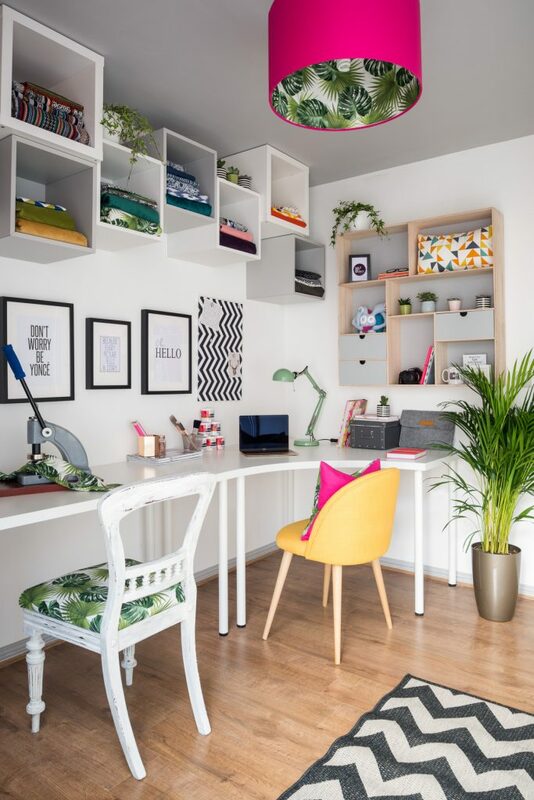 Due to the layout of the room, there was only one full wall available for shelving and desks, the other two walls were cut up by a large full length window, built in cupboards and a radiator, meaning we needed to maximise the use of the open wall. I wanted to incorporate as much storage as possible, so shelving was a must, but there needed to be room to work beneath the shelving at the desks. I opted for these great Ikea box shelves which all come individually so they allow you to build your own shelving design. Fixed right to the top of the room, they offer a great storage solution while not impacting the use of the space below. For the colour scheme, I wanted to maximise the amount of light, so we kept the walls white and added a twist of pale grey ceiling and woodwork. 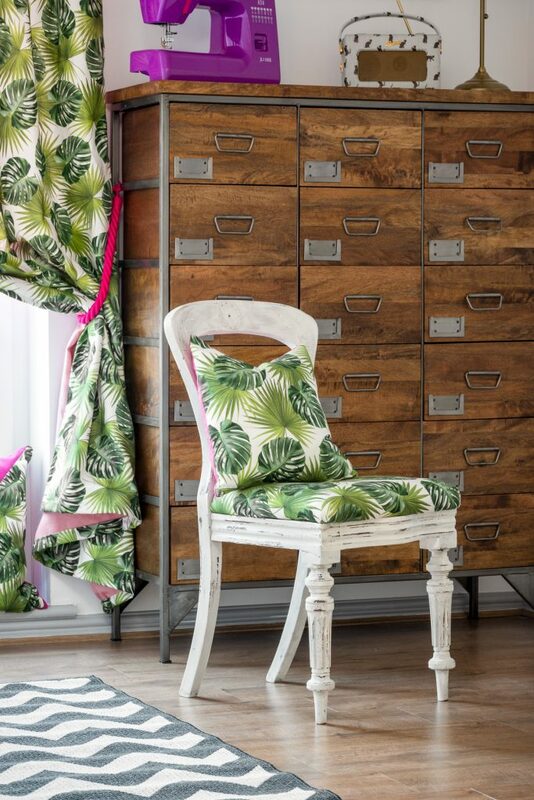 To give the space some colour I accessorised with tropical leaf prints, and pops of bright colours. Geometric prints in black and white were added to give the room modern twist and contrast with the safari print. The result is a bright and exciting work room, which is not only practical but is fun and inspiring. 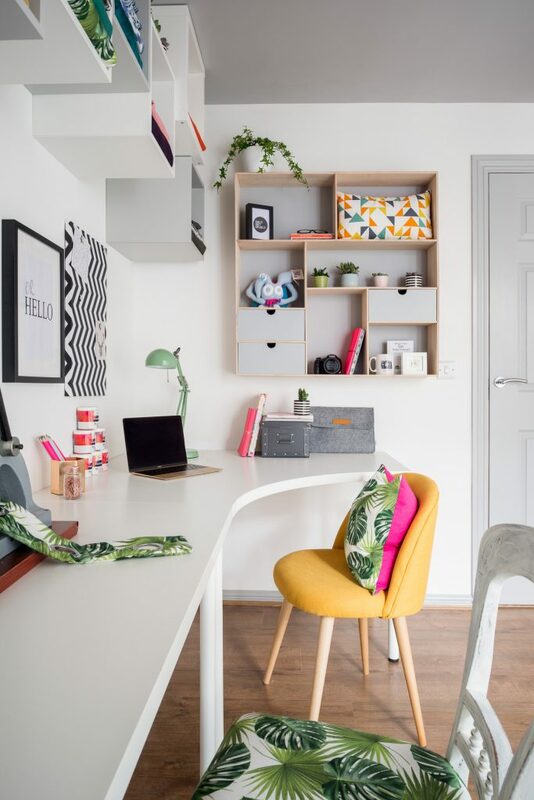 Overview of home studio, yellow chair from Maison du Monde, desk and shelving from Ikea, lampshade and white chair from Victoria Hopkins Interiors. Home office also used as a craft and sewing room. Woodwork and ceiling painted a pale grey to tie in with shelving accents. This lovely distressed chair is a custom piece, please get in touch if you would like a similar design.